Control of fleas, ticks, heartworms and other dangerous parasites is a year-round effort, especially in Cedar Park, Texas and the surrounding areas. Because of the prevalence of parasites in our area, Block House Creek Animal Hospital is especially knowledgeable about treating pets for parasites as well as educating pet owners on prevention and control. Prevention is essential to keeping your pets safe and comfortable. Parasites are not merely a nuisance: some may cause serious illness in pets AND humans. Parasites can even be fatal. 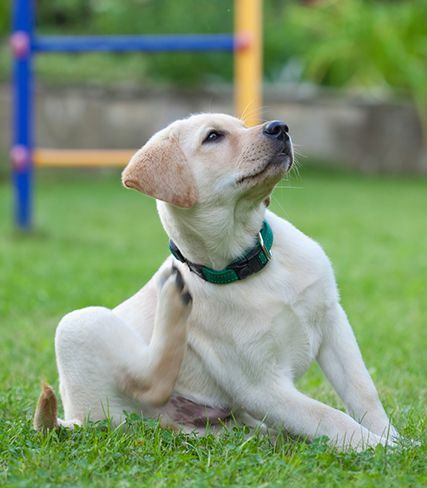 External Parasites (Fleas, ticks and mites) - fleas typically do not cause extensive damage, but they are a nuisance for both pets and owners; ticks are known carriers of Lymes Disease, and pets that spend time outdoors should be checked often; mites can cause infections in the ear from scratching; mange mites may cause scabies or mange and when left untreated, may compromise your pet’s immune system; mites can easily transfer between animals, so prevention and treatment is important. Heartworms are a serious and potentially fatal disease in pets. Twelve-inch long worms dwell in a pet’s heart, lungs and blood vessels of infected pets, causing lung disease, heart failure, organ damage and fatality. Mosquitos then transmit the disease from one animal to the next and it only takes one bite. They live in the animal, producing baby worms that circulate in the bloodstream. Heartworms can grow and live for 5-7 years in dogs and 3 years in cats. Block House Creek Animal Hospital has safe, effective products that cater to you and your pet's lifestyle and budget. Heartworm prevention is provided 12 months of the year with varying options on treatment intervals and dosages. You may not always be able to tell if your pet has parasites. Fleas can easily hide under your pet’s fur, and ticks burrow into the skin and often go unnoticed, as they are the size of a pin. Intestinal parasites, like roundworms, can cause diarrhea, but many infected pets don’t show any signs of illness at all. Ticks can transmit infections like Lymes disease, and fleas can transmit tapeworms and Bartonella, a bacteria that causes “cat-scratch fever” in humans. With a preventative care exam, we will fit your pet with the appropriate medications to help control fleas, ticks and other parasites. Parasites are both a nuisance and a danger to you and your pet, but being aware and proactive in their prevention can be the key to a healthy lifestyle for your pet. Call your veterinary experts at Block House Creek Animal Hospital today to find out how we can help you prevent and/or treat pet parasites in the Cedar Park, Texas area.